Amazon Marketplace Put your products in front of tens of millions of Amazon shoppers. With no per-item listing fees, Amazon can help you grow your business. – Benefit from a brand that ranks #1 in reputation as determined by a 2016 Nielsen Company survey. Amazon will do the lifting for you and Scale swiftly and reach even more customers with Fulfillment by Amazon, world-class fulfillment service. Amazon We pick, pack, and ship your products and take care of customer service and returns—all so you can focus on growing your business. Get the word out—boost your product visibility and help maximize sales with Advertise on Amazon. Here Amazon sells it for you, Amazon ship it for you. Amazon pay you your Cash, Amazon has created one of the most advanced fulfillment networks in the world, and your business can benefit from Amazon expertise. With Fulfillment by Amazon (FBA), you store your products in Amazon’s fulfillment centers, Best of all, FBA can help you scale your business and reach more customers. This Will Enable your listings on Amazon to qualify for Amazon Prime and Free Shipping on eligible orders with world-class fulfillment. 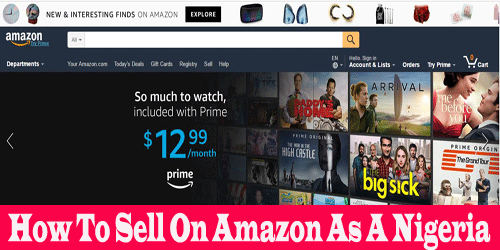 Advertising on Amazon is an easy way for you to promote your listings. Ads appear right where customers will see them, such as the first page of search results or product detail pages. You place bids on relevant keywords, and if your bid wins and your ad matches the search, your ad gets displayed to shoppers. These targeted ads can bring your products to a new audience and help you maximize your sales. 7 responses on "How To Sell On Amazon As A Nigeria"
Thank you for the information this is really Great but the video has been removed. Is there textbtextbook that give detailed information on how to sell book on Amazon? Hello nairalearn. Great and useful information that i couldnt find anywhere else on this topic. I just have one question if your relative in the approved country opens a bank account for you and links it to payooner. How are you going to receieve your money here in Nigeria in cash. Do they have to send you the credit card or payooner card through mail etc DHL. i will appreciate your insight. Its becoming very clear to me thanks to your vid. Hello. Thank you for the write up. I have a bank account in the USA with a debit card, can I register as a seller in Amazon even if I am resident in Nigeria?